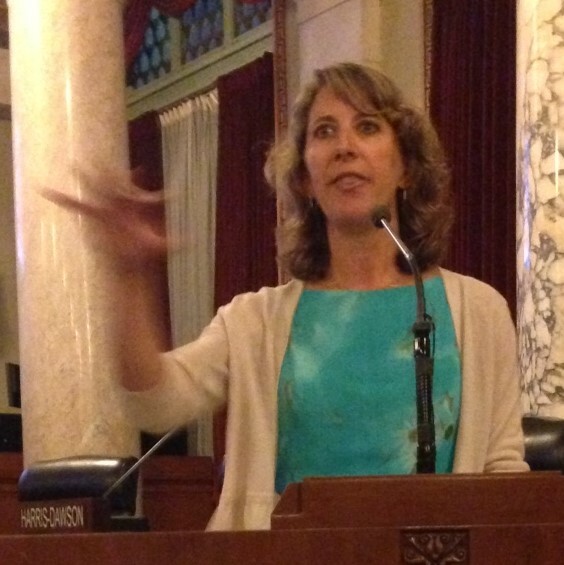 National Vision Zero advocate Leah Shahum speaking at L.A. City Hall last night. Photo: Joe Linton/Streetsblog L.A.
Last night, the city of Los Angeles welcomed national safe streets advocate Leah Shahum at a forum discussing what Vision Zero will mean for Los Angeles. For the uninitiated, Vision Zero is a road safety policy that adopts the goal of zero traffic deaths. That zero applies to everyone: people walking, driving, riding, etc. Vision Zero stems from the principle that traffic deaths are preventable and unacceptable. The concept originated in Sweden in the 1990s and has spread to many cities in the United States. When the City Council approved Mobility Plan 2035 last month, Los Angeles became the 9th U.S. city to adopt Vision Zero. The reach of L.A.’s Vision Zero policy was extended to all city departments by Mayor Eric Garcetti via a recent mayoral executive directive. Garcetti’s directive mandates that numerous city departments work together with community groups to reduce L.A. traffic deaths to zero by 2025. The directive also includes an interim goal of reducing traffic deaths by 20 percent by 2017. Traffic death numbers are enormous. In the U.S. every year, more than 30,000 people die “just trying to go somewhere.” The rate of serious injuries is a hundred times that. Speed matters. Deaths increase as speeds increase (see graphic below.) Managing speed is the top priority for improving safety. In successful European examples, traffic deaths decreased even as the overall number of trips increased. 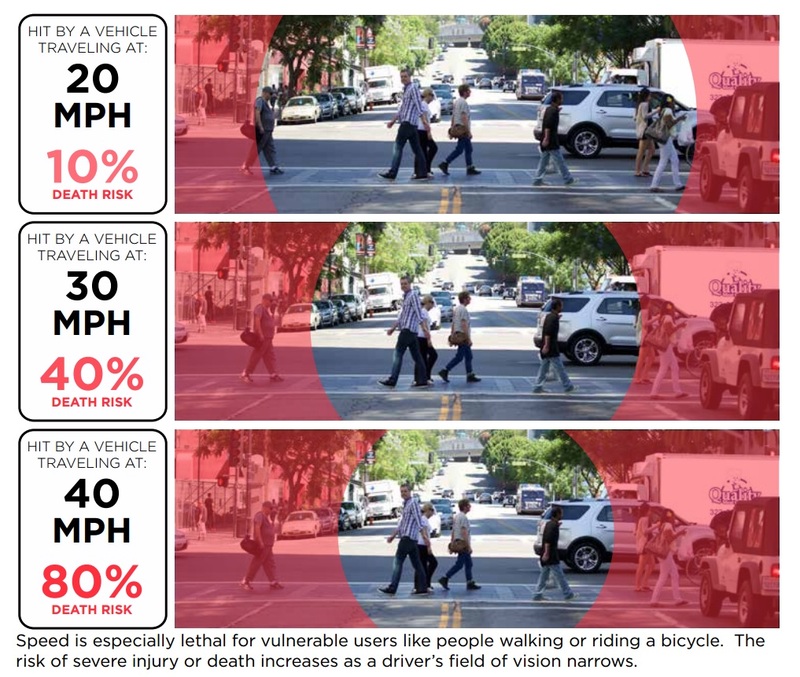 Vision Zero is not about less travel or fewer trips, but about making all trips safe. Vision Zero takes a systems approach to safety. Safety is not about the individual driver’s behavior, but about putting systems in place where inevitable individual errors do not result in loss of life. Shahum looks forward to the day when people will look back at today and wonder why we tolerated speeding. She expects that future generations will perceive speeding the way that people today think of drunk driving or smoking. Culture changes over time; things that seemed acceptable can become intolerable. A question and answer session followed, with Shahum, Reynolds, and TRUST South L.A.’s Malcolm Harris representing L.A.’s fledgling Vision Zero Alliance. Reynolds emphasized the need for “low-hanging fruit” solutions, including street projects (mentioned above), plus professional driver training, and possible implementation of automated speed enforcement (e.g. speed cameras). A number of questions focused on equity. Traffic deaths are more prevalent in low-income communities of color, but some Vision Zero tactics can include targeted law enforcement, especially to curb dangerous driver behavior, mainly speeding. Increased enforcement could worsen already strained relations between police and communities of color. All speakers emphasized the need to work with different communities to craft appropriate and effective safety measures. Vision Zero is a relatively new concept in the U.S.; New York City adopted it first, nearly two years ago. It is very new for Los Angeles, where the emphasis has long been on increasing capacity for automobiles. Vision Zero can change the culture of how Angelenos get around, but it remains to be seen how implementation will take shape here. Good points here. It’s nice that DTLA is now finally becoming the kind of place where a car is no longer a necessity. I think the biggest challenge here is shopping. Downtown hasn’t *yet* seen a massive influx of major retailers, but I suspect that’s just around the corner. And even still, I’ve found that there’s a decent number of shopping venues located within walking distance of a Metro station, and thankfully most Metro stations require only a one- or two-seat ride from DTLA. For everything else, Zipcar has proven to be both a lifesaver and a cost-saver (vs car payments and insurance premiums) for me.